At the end of the day, some students head to after school activities to get involved and reach non-academic goals . “I am looking forward to the pep rally, football games, [and] homecoming,” said Reeves. As the new school year begins, students everywhere are creating goals for the upcoming year. Despite a age difference of four years, seniors and freshmen are setting similar goals. “[My goals as a senior] are to keep my GPA where it is, to make the most of my final year of high school, and to enjoy it to the fullest,” said senior Jacob Strubelt. Even though Strubelt has had three years to work and develop his GPA, and freshmen have barely made their mark, they both are setting academic goals. “[I want to focus on] passing all my classes, finding an idea of what I want to do long term, and get experiences in different fields,” said freshman Molly Reeves. 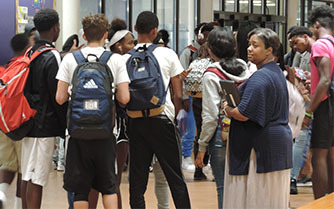 Despite the freshman class only just beginning their high school career, they are nervous about getting acclimated to the workload that they will receive throughout high school versus their smaller workload that they may had during middle school. “[High school] as of right now [is] only a little stressful because I’m just getting into it, but I’m sure in the future there will be more stress about everything,” said Reeves. Besides focusing on academics, seniors and freshmen are making goals for their future after high school. “I want to become a doctor. I’m planning on going to UMKC to get a degree in medicine,” said senior Daniel Ard. Reeves also has some idea of what she wants to do long term. “[After high school, I see myself as] probably some sort of teacher or something working with kids,” said Reeves. As seniors are bringing their high school careers to a close, they reflect on what they wish they would have done differently during their freshman year. “[When I was a freshman], I wish I wasn’t as lazy and slept right when I got home. I just wish I overall spent my time better,” said Ard. Strubelt has similar things that he wished he had done differently during his freshman year and the years after. “[When I was a freshman, I wish] I would have changed my study habits. I do well, but if I had developed good study habits, I could have done better in high school and kept those going on to college,” said Strubelt. Though the seniors have already set their goals for after high school, and have been preparing since freshman year , the freshmen have plenty of time to construct their habits and develop long-term goals.